Austin and the surrounding Texas Hill Country features incredibly diverse landscapes, offering everything from green, rolling hills to limestone cliffs to rocky riverbeds to mesquite and pine forests. But the area also contains a lesser-known, hidden treasure - the intricate underground cave systems scattered throughout surrounding counties. Visitors seeking a guided tour of these subterranean networks or a more technical, hands-on adventure can find options in every direction from Austin. Here’s an overview of some of the most fantastic access points to the Hill Country’s underworld. Inner Space Caverns. Credit Lars Plougmann, courtesy of RootsRated. 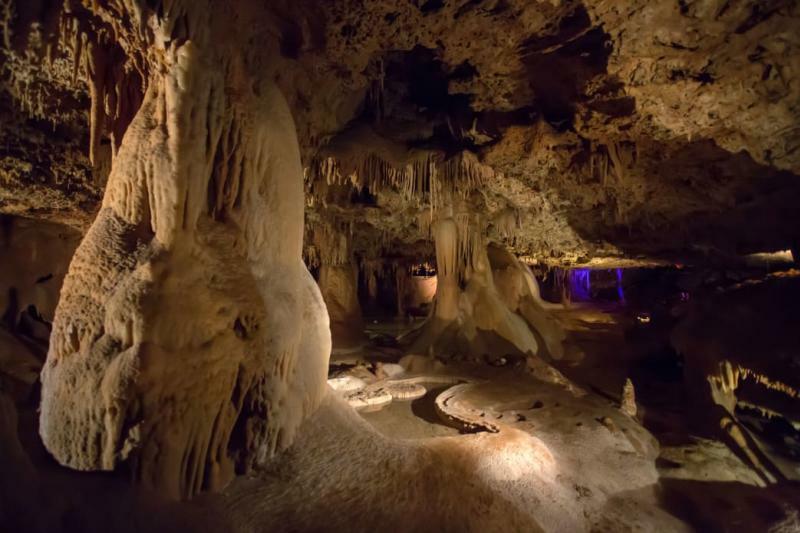 Inner Space Caverns are just north of Austin in Georgetown, Texas, and they provide the opportunity for inexperienced, curious cavers to see a wild underground world of a cave that was "hidden" for more than 10,000 years. Guided tours are available for all skill levels and all degrees of adventure. Visitors can take a low-key tour through the living cavern or join something a bit more adventurous. One tour takes guests through the cavern’s hidden passages, while another takes you through “off-trail” and into undeveloped sections of the cave. Accessible by way of the Barton Creek Greenbelt, Bullet Cave is a cave for self-guided explorers seeking a glimpse into Austin’s underground. At just 100 feet long, you can submerge yourself into complete darkness, crawling through 40 feet of a narrow passageway into what area cavers call the Ritual Room — a section of the cave that’s 8 feet wide and 15 feet high. From there, a narrow, 20-foot crawlspace takes explorers to the backside of the cave, where you must turn back and venture out the same way you came in. Less than two hours southwest of Austin, you’ll find Kendall County’s Cave Without a Name — a cave that many call the most beautiful in Texas. Guided tours take visitors through six different rooms, all with spectacular rock formations including stalactites, stalagmites, soda straws, cave drapery, flowstones, and rimstone dams. While the cave itself is beautiful to explore, Cave Without a Name also takes advantage of its incredible acoustics and hosts musical performances — underground. Airman’s Cave — the longest cave in the county at more than 11,000 feet — is accessed by first going through Whirlpool, a great cave for beginners, and the narrow Maple Run. Not far from Bullet Cave and also accessed within the Barton Creek Greenbelt, the Airman’s section of this network is considered an intermediate or advanced section containing tight corridors, access to only a few rooms, and sections that require the "dead man’s crawl" — which means pulling yourself through its narrow quarters on your belly with the strength of your forearms. Longhorn Caverns are another local cave system accessible by guided tour. Located in Burnet County within Longhorn Caverns State Park, the 11-mile cave has a rich geological history, told best by the guides who give tours of the cave’s lower levels paired with powerful storytelling about the cave’s history and the prehistoric creatures who once called this tract of land home. Visitors are guided through passageways and corridors with proper safety equipment, with a promise of getting both dirty and wet. Backdoor Cave is just downstream from the Barton Creek Greenbelt’s famous Sculpture Falls. The cave is alongside Backdoor Spring, a particularly beautiful area in the Edwards Aquifer. Thought to be an old spring itself, the small cave is just 60 feet in length and 15 feet in diameter, but offers a tucked away look at the interesting rock formations formed by Barton Creek.